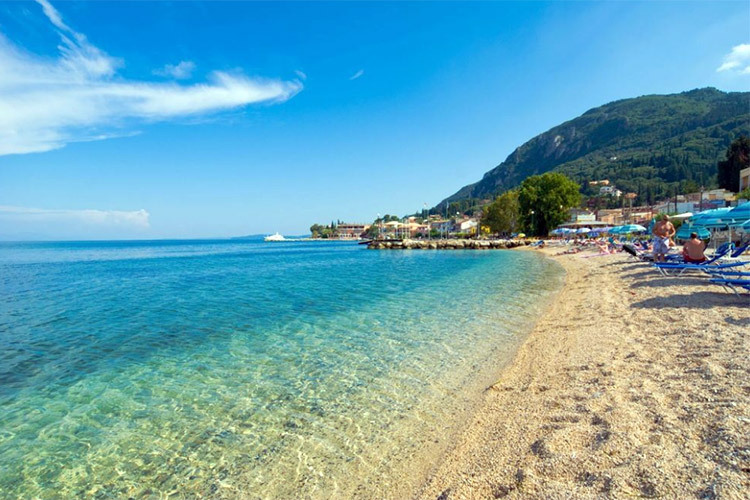 Not so far from the main town of Corfu, Benitses is a small nice village well organized to satisfyany need of the tourist. Benitses is mostly developed along the coast road and it offers facilities, tranquillity and privacy at the same time. In all Kerkyra island this village is one of the few that still keep their traditional Greek style. You will see old buildings hidden in the nature and fishermen working with their nets in the small port. Here in Benitses there are also the ruins of an ancient villa and the Roman Baths. There are many beaches both sandy and rocky near Benitses. In the bigger one there’s also the opportunity to enjoy some water sports and to take small boats for rent. The other beaches are smaller and they offer more privacy and quiet. The sea here is really beautiful and becomes deep very fast. At the end of the big bay there’s a small pear used by fishermen and tourists. Benitses is connected with the town of Corfu every day by the local bus service. It’s moreover possible to take jeeps, motorbikes or bicycles for rent. Here in Benitses you can find many kinds of local shops like supermarkets, pastry shops, jewellery shop and tourist shops. There are also internet points and tour operators that can take you to visit the Achillion palace. In the night you can choose between different local restaurants where you can eat and few pubs where you can have a drink after the meal. Benitses is not the right place if you want to dance all night long. Benitses is a village that offers different kinds of accommodation such as studios, apartments and hotels with swimming pool.